The effects on species that thrive in cold waters provide glimpses of the damage that rising ocean temperatures can do, but the federal and state response remains weak. The Gulf of Maine is experiencing its third-warmest year on record, triggering the starvation of puffin chicks off the Maine coast, mass strandings of sea turtles in Massachusetts, and heightened concerns about the survival of endangered right whales and the North Atlantic’s largest kelp forest. Surface temperatures in 2018 are running 2.8 degrees Fahrenheit above normal, a level exceeded only in 2012 and 2016 during the 37 years that satellite records of sea surface temperatures have been collected in the gulf, says Andrew Pershing, chief scientific officer at the Gulf of Maine Research Institute in Portland. Pershing tracks the data and first drew attention to the rapid warming of the gulf, which is happening faster than in any other part of the world ocean, except for a section of the Kurushio current northeast of Japan. The news comes on the heels of a dire report from the federal government – the latest National Climate Assessment – warning that climate change is fueling deadly wildfires, damaging hurricanes and dangerous heat waves in the United States, and that the situation will grow more catastrophic. Pershing was the lead author of the report’s oceans section, which for New England projected declines of key commercial species such as Atlantic cod, scallops and lobster, and a worsening environment for already endangered Atlantic salmon, right whales and sturgeon. Nick Record, senior research scientist at the Bigelow Laboratory for Ocean Sciences in Boothbay, says the 2018 warming is equally striking in deeper water, with the deepest layers of the Jordan Basin – those more than 600 feet below the surface – reaching an average of 48.5 degrees, the second-highest on record after 2017, when the annual average was 48.7 degrees, or nearly 2 degrees above normal. “When you have a system that is warming this fast and is entering an unprecedented environmental state this rapidly, I would expect to see a lot more surprises,” Record says, such as blooms of toxic algae or declines in tiny copepods that herring and right whales feed on directly, and seabirds, cod and other species secondhand. 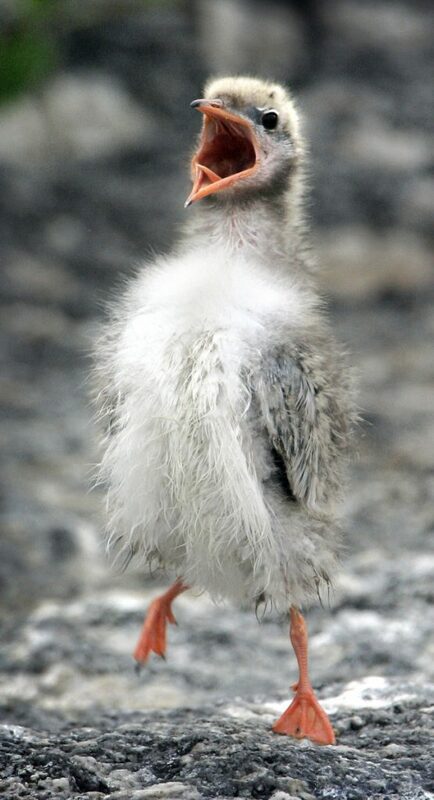 A common tern chick calls out for food on Eastern Egg Rock, a tiny island that offers a nesting ground to about 6,000 seabirds, including puffins. Puffin colonies off the coast of Maine had a tough year, despite a reprieve in warm conditions off their breeding islands in the late summer, which repel many of the tiny fish the birds eat. “For a while there it looked as though it was going to be a really, really bad year because they weren’t bringing in much food and the chicks were growing really slowly, but by the end of July things picked up in time to save a lot of chicks,” says wildlife ecologist Tony Diamond of the University of New Brunswick, who oversees seabird restoration efforts at the largest puffin colony, Machias Seal Island about 20 miles off Machias, which has 5,500 breeding pairs. In the end, only 32 percent of the puffin chicks survived, down from 68 percent in 2017, as the birds tried to survive on tiny larval fish resembling little strips of jelly rather than the nutritious herring they once relied on. This year was actually an improvement over 2016, the worst year on record, when only 12 percent of chicks survived. Colonies at Eastern Egg Rock, Matinicus Rock, and Seal Island in midcoast Maine had similar experiences, with many chicks starving when water temperatures spiked in midsummer. When the reprieve came later in the summer, adults were able to find enough baby haddock and winter hake to save the surviving chicks, but it took nearly twice as long for them to fledge and many left well underweight, says Donald Lyons, director of conservation science at the National Audubon Society’s Seabird Restoration Program. Ultimately, 45 percent of the puffin chicks fledged at the three midcoast islands – down from a typical year of 60 percent – while terns on the islands also saw high chick mortality. About 600 Kemp’s ridley turtles like these, lured into the warming gulf, washed ashore on Cape Cod late this year, when the cold finally set in. 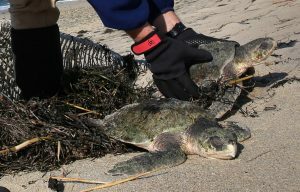 The warm water proved a deadly trap this summer for hundreds of tropical sea turtles that followed it into the Gulf of Maine, then suffered cold shock as the water rapidly chilled with the onset of winter-like weather. As of late last month, some 600 turtles – most of them Kemp’s ridleys – had washed ashore on Cape Cod, nearly half of them dead, the rest unable to swim and suffering from hypothermia. “The fact that we’re seeing most of our warming in the summer and fall, rather than the winter, means you have a really, really big drop in temperature, and the turtles get caught in that because they just aren’t accustomed to such a sudden change,” Pershing says. 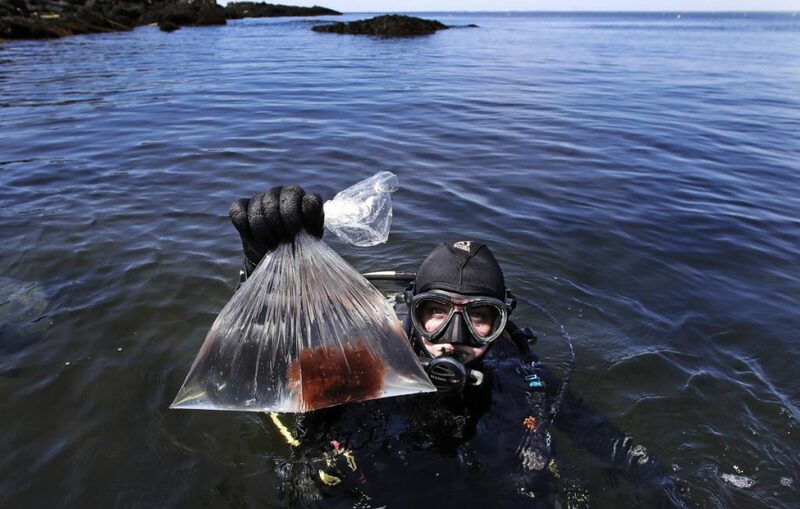 The warm conditions are also wreaking havoc on the North Atlantic’s largest kelp forest, located at Cashes Ledge, a submerged mountain ridge 80 miles southeast of Portland. The kelp forest, encompassing several square miles, covers the summit and ridges like a jungle canopy, sheltering fish at a density 50 times that of coastal sites in the region. “When you dive there, it’s like a false bottom of swaying kelp, and when you come down from on top of it, it’s like parachuting into a rain forest,” says Jon Witman, biology professor at Brown University. He has been doing just that since 1977 and was one of many scientists who tried unsuccessfully to have the area made into a national monument. The kelp forest “creates a habitat, an edible habitat, for many other creatures,” Witman says. But kelp – like cod, lobster, puffins and many other Gulf of Maine species – is a cold-loving organism living at the southern end of its range. The rapidly warming gulf is turning places like Cashes Ledge inhospitable. When water gets into the high 60s, Witman says, the fronds and leaves fall apart, and encrusting, warm-water bryozoans smother them in white, calcified colonies. “It’s just devastating,” he says, both for the kelp and the creatures who live there. In recent years, scientists have identified the Gulf of Maine as the second-fastest-warming part of the world ocean, in part because it is vulnerable to shifts in the relative strength of the frigid Labrador Current – which normally feeds the gulf – and the warm-water Gulf Stream, which can intrude when the cold current weakens. The Labrador Current is feared to be weakening as a side effect of the melting of the Greenland ice sheet. The effects in the Gulf of Maine can be dramatic for human and marine life alike. An “ocean heat wave in 2012” caused lobsters to shed six weeks ahead of their usual schedule, throwing off the timing of Maine’s soft-shell harvest and leading to conflicts with New Brunswick fishermen over access to Canadian lobster processing facilities. The population of green crabs exploded, and they devoured most of the clams in Freeport, Brunswick and other towns, tearing up seagrass beds in many bays, while puffin chicks on Eastern Egg Rock starved because their parents couldn’t find appropriate food for them. Maine has done little to respond to the crisis, with state policymakers ignoring the recommendations of a bipartisan panel of experts convened by the Legislature nearly four years ago that concluded that ocean acidification – a byproduct of global warming – represented a potentially catastrophic threat to Maine’s marine harvesters. The panel advised moves focused on closing the information gap about the threat, but little has happened at the state level. Scott Ogden, spokesman for Janet Mills, who will replace Gov. Paul LePage in January, said the governor-elect takes climate change threats seriously. In April, Maine U.S. Sens Susan Collins and Angus King wrote to the head of the National Oceanic and Atmospheric Administration, Tim Gallaudet. They urged the federal agency to enhance monitoring of the subsurface conditions affecting the Gulf of Maine, saying it was “critical not just for Maine and New England states but for our country as a whole.” NOAA responded with a description of the status quo, suggesting the Trump administration did not intend to increase monitoring resources. Asked for a reaction last week, spokespeople for Collins and King provided a joint written statement noting that NOAA had not addressed “their serious concerns about the gulf’s unique vulnerabilities and unique assets,” and pledging that the senators would continue to seek ramped-up federal, state and local research efforts. For more than three years, the Republican-controlled Congress has failed to schedule a hearing on a bipartisan bill introduced by Maine Rep. Chellie Pingree, D-1st District, and co-sponsored by Rep. Bruce Poliquin, R-2nd District, that would direct NOAA to assess the likely impacts of acidification on coastal communities and identify gaps in knowledge. A spokeswoman for Pingree said the congresswoman intended to reintroduce the bill in the new Congress, where the House will be under Democratic control. Meanwhile, scientists in Maine say their ability to monitor the situation is actually eroding, as budget cuts undermine ocean monitoring efforts. One vital tool for tracking links between warming water and ocean creatures, an annual survey of marine algae, was discontinued last year after four decades because of NOAA budget constraints. Another, a series of offshore data collection buoys called the Northeastern Regional Association of Coastal Ocean Observing Systems, was partially off-line for large chunks of the year. Two of the buoys, which are owned and operated by the University of Maine, were damaged by storms, with one critical one at the main oceanographic entrance to the Gulf of Maine off-line for an entire year, depriving scientists of key data about conditions in the gulf. “Due to funding constraints, the University of Maine is not able to recover and redeploy the buoys as quickly as they used to be able to do,” says the program’s spokesman, Tom Shyka. He noted that the buoys are also operating beyond their intended lifespan and there is no money to replace them.